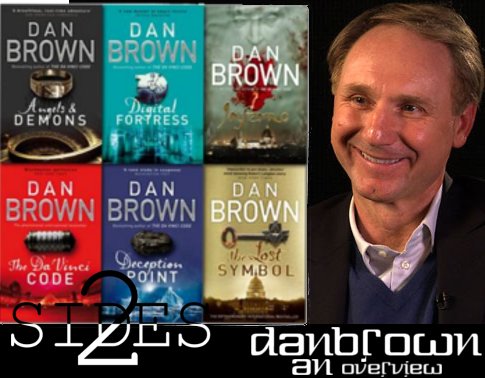 Everyone knows Dan Brown, he needs no introduction. 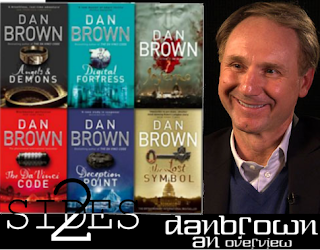 Daniel Gerhard "Dan" Brown is an American author with international repute who specialises in thriller/mystery category. Till date he has written seven thriller and books of other genres. He may not be prolific but he has built a reputation on those seven books and is one of the most adored writers of his generation. Song writing and music were his initial passions before focussing on writing thriller novels. Inspiration struck him when he read a Sidney Sheldon novel , The Doomsday Conspiracy ,while on a vacation and thought to himself that he could emulate him. After five years of writing , he published his first thriller , Digital Fortress, in 1998. Regardless of the huge popularity of his books now, success didn't come easy as it was his fourth novel , The Da Vinci Code , that got him noticed. The book went on to become an all-time best seller. As of 2009 more than 80 million copies were sold and was translated to 55 languages. Only a handful of books have had better sales than the controversial work. The enormous volume of sales boosted the sales of his other books as well. Anyone who has read Dan Brown can stand testimony to his mastery of the thriller and mystery genres. He has made the genre in which he writes his own. Most people confuse between the genres of thriller and mystery .They use them interchangeably. The fact is , of course , that they are not synonymous. Most authors struggle handling either of them. But he has married both of them and now lords over it. Favours turned in Browns direction with the introduction of his character Robert Langdon. The character made his first appearance in the 2001 novel , Angels and Demons. If one looks closely enough , the influence of 'Langdon' in Brown's works precedes his appearance. In the first Novel, Digital Fortress , a similar character plays an important role. David Becker is also a professor , suave , intelligent , and cool under pressure. He also embarks on a treasure hunt to retrieve something valuable.Hence it may safely be concluded that Dan Brown retained and modified the mould of a charismatic professor who had no dearth of chivalry. In retrospect , the move has reaped dividends. Virtuous professors apart, Brown derives inspiration from his personal life for his works. To quote an example, many of the characters in his books are his acquaintances and friends in the real world. Langdon, his protagonist, the Harvard professor and author, is named after one of his friends. Langdon's editor in the novels is Jonas Faukman, which is the anagram of the name of Brown's editor, Jason Kaufman. Kaufman is not an exception, in fact, some of the situations in the books are borrowed and adapted from his experiences. For instance, the relationship between the characters Sophie Nevéu and Jacques Sauniére of The Da Vinci Code was inspired by the bond with his father. Essence of Dan Brown's action-packed novels is usually set over a time span of just twelve or twenty four hours. He depicts the events in real time. Which means , the time taken by an average reader to complete the book is roughly the time span of the events described in the book. Raised high are the stakes in all of his books. This involves the lead character and his sidekick, if any, to go around a city looking for clues to unravel the mystery within a certain deadline. Nearly all books stick to this format of a "Treasure Hunt". Intensive to each Dan Brown novel is multiple threads of stories, along which different situations and characters evolve. These seemingly unrelated perspectives converge towards the end of the book. He extensively uses history , cryptographic techniques and mathematical trivia in his books. Caesar square , Caesar shift , ambigrams , anagrams, Franklin's magic square , Golden ratio and Atbash cipher are some of the examples to make an appearance in his novels. For example , Caesar Square is a not too obscure cryptographic method to encrypt your information by taking individual letters of the string of characters and filling a square matrix with them , row-wise. The transpose of the matrix gives scrambled version of the message. For example, the nine lettered phrase "AN EXAMPLE" becomes when encrypted, "AXPNALEME". Ever present in his stories are the underlying themes are symbols , art history , cryptography , religion , secret societies and science. The author maintains that the facts referred to in the novel are accurate and the situations are fictional . All of these subjects are very dry on their own , but Brown works his magic and manages to make them interesting , even enchanting. One feature that stands out in his works is his obsession with the details. He elaborates on even the tiniest of the details in some depth. His usage of personification livens up even the most inanimate objects. Very detailed research is carried out before Brown starts to any book. Just like the attention to details given for the research, Dan Brown characters in the books are also very vividly sketched. Some attribute his mastery to the fact that he introduces each of them separately, which allows the reader to understand them deeply. Much of the Brown's acclaim can be traced to his greatest strengths as a thriller writer; his ability to manipulate and coerce the reader into thinking that (s)he has a perfect understanding of the situation is unmatched. This confidence translates to incredulity by the time the final page is flipped through. By the end of the book , your impression of a character or an event will have taken a diametrically opposite position. Some of the switcheroos are simply jaw-dropping. The writing style is so racy that the plot is filled with numerous twists and turns. He redefines the notion of 'edge of the seat thriller' and ends virtually any chapter in his book with a cliffhanger. Key to his success also are the vibrant quotes in his books. For instance, his philosophical takes are ethereal. He commented on faith thus- " Faith ― acceptance of which we imagine to be true, that which we cannot prove." Vanity, faith and greed are among the most common driving forces in Langdon books. Another pearl of a quote is "Men go to far greater lengths to avoid what they fear than to obtain what they desire." Freemasons, Illuminati, Knights Templar and such secret societies and their surrounding conspiracy theories form the favourite hunting ground of Dan Brown. That combination has worked out rather successfully. One of the recurring and controversial themes that he explores is the apparent disagreement between science and religion. Nevertheless, in Angels and demons, he demonstrates how science and God are not in conflict and how they complete each other. Similar theme was explored in Origin, which focussed on creationism. Yet, Brown attributes his fixation on the topic to his childhood. His mother was a church organist and father a maths teacher. While he was growing up , he was an ardent believer of The Bible's version of Genesis.When he learnt about the big bang , he asked a minister about the contradiction .When he got no satisfactory reply from the minister , he began favouring science over religion. Said he in a 2009 interview "My life has come an entire circle", commenting on the topic of his belief. As to his interest in puzzles and the like, he credits his father for instilling enthusiasm in him. Earlier novels notwithstanding, in his latest novel, Origin, he has made an effort to deviate slightly from the basic architecture. Langdon is hunting, of course , without a timer ticking down. The treasure hunt phase has considerably mellowed down. In his most renowned book, The Da Vinci code, Brown depicted Jesus as a married man and claimed that his bloodline continues to this day. It was equivalent to stirring a hornet's nest. Most unsurprisingly, the Vatican objected to this and blasted him for portraying Christianity in a bad light. The Vatican called for a boycott against the film adaptation of the novel. Just twice has he been sued under allegations of copyright infringements, and Brown won in both cases. Central to the allegations were novelist Lewis Perdue and his publisher Random House who dragged Brown to court for allegedly plagiarizing his novels The Da Vinci Legacy(1983) and Daughter of God (1999). Over the year of 2006, Michael Baigent and Richard Leigh, initiated legal proceedings against the publisher of The Da Vinci Code . They claimed that Brown copied some parts of their work in his novel without their knowledge or consent. They argued that the name of the character Leigh Teabing was derived from surname of Richard Leigh and by rearranging surname of Michael Baigent. Full acquittal by the court validated Dan Brown's stance, despite noting the Judge noting in the judgement that "He has presented himself as being a deep and thorough researcher...evidence, in this case, demonstrates that as regards DVC [The Da Vinci Code] that is simply not correct with respect to historical lectures...The reality of his research is that it is superficial." Victorious in court, Brown defended himself, saying that some of the ideas in Baigent's and Leigh's book was "indispensable" to him and that there were other sources too which provided him with the same information. Unlike Brown's own opinion on the subject, some people opine that Dan Brown courts controversies for grabbing people's attention on his novels. They say "There is no such thing as bad publicity." Literary world has not spared him for factual inaccuracies as well . Historians have refuted some of the so-called facts in his novels. Scientists say that his portrayal of science in Angels and Demons is misleading . The preface of the book states that anti matter is a clean fuel and a few grams are all that is required for powering New York city for a week. At the current rate of production , it will take years to produce that amount of anti matter at the world's most advanced and largest facility , the CERN. The other objection is that the energy spent to produce the antimatter is more than a billion times the energy it can provide , making it an inefficient and ridiculous process. Nazis, the grammar variety, have also been up in arms against Langdon. Among the other charges levelled against him is that his grammar appears to be unconventional . Some people apparently can't stand bad grammar and have been very vocal about it. In conclusion, his genius in writing thrillers is unparalleled. The fan following that he has is the envy of his contemporaries. The people who love him despite all his 'flaws'. Eternally interesting it is to consider this quote by the master story teller. "Small minds have often lashed out at what they don't understand".